I was struck by how that relates to the text we find in I John 1:1-4. I’d like to share this with you over the next couple of posts. First, we see the aspect of LIFE in v. 1. As creatures of God, we exist to exalt Jesus Christ (Rev. 4:11). As sinners, mankind falls far short of that purpose, except that when we accept Christ’s sacrificial death on the cross, we enter into that relationship which allows us to worship and honor Him by living the redeemed life. As Christians, we have our very life and reason for existence in Him. If we are here for any other reason we are here for the wrong reason. John 1:1 tells us that He is the Word. He is the Word of Life. He has always been and He will always be. Anything else we may be about will pass away. He is the LIFE, He is the Rock, the Foundation of life for His people. I mentioned (briefly) in a recent post that I was at the NC Bi-vocational Ministers Conference. For those who may not be familiar with the term bi-vocational means two vocations. Two callings. Two careers. So, a bi-vocational minister is a pastor, music minister, evangelist, etc AND something else. That something else consists of farmers, plumbers, military members, law enforcement, firemen, judicial officials, postal employeess, teachers, mechanics, salesmen, warehouse managers, and many, many more. These are just the ones I know. Each year we come together for a weekend at Caraway Conference Center near Asheboro, NC. This means all these guys have to not only take off from the church, but often they must take vacation from their other vocation as well. But, let me tell you it is ALWAYS worth it. The conference speakers are good, the fellowship is wonderful and the encouragement is priceless. This year our main conference speakers were Jim Henry (Pastor Emeritus of FBC Orlando, now interim pastor at Biltmore Baptist) and Ray Gilder who is himself a bi-vocational pastor. His “other” vocation is with the Tennessee Baptist State Convention where he serves as a coordinator for bi-vocational ministers and churches. Yours truly was blessed to be on the program Sunday Morning. The focus was on the minister’s family. Whether bi-vocational or fully funded, the minister’s family faces the same attacks and challenges as any other. This time together was a reminder that God established the family as the basic building block of society (and the church). Just as in other areas of life it is often easy to mistake activity for effectiveness and “church work” for a Christian walk. Any family, ministerial or not, which does not have God at the center & Christ as the foundation is in trouble already. My prayer for you today is that you will take stock of where your family is and ask God’s guidance and leadership to move you where you need to be. 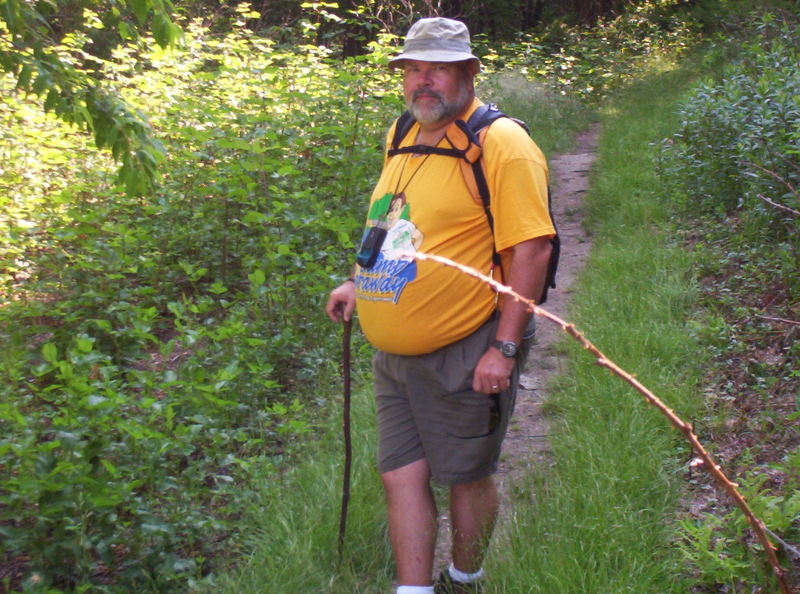 On our trip a couple of weeks ago Eileen wanted to go for a day hike on the Appalachian Trail. 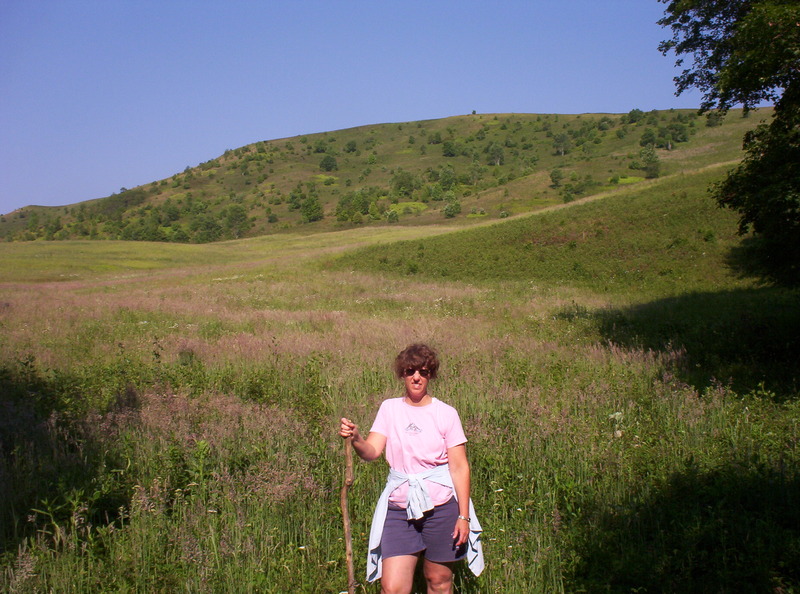 We did a small section (about 5 miles) in the area of Max Patch Mountain and then up to the top of the mountain. This is me on the “AT”. From the top of Max Patch Bald, the view was stunning. Words cannot adequately express the grandeur of God’s creation – in fact I’m not one to burst into song, but all I could think of as we took in the view was “This is My Father’s World.” To add to the beauty of the view, we met some great people along the way, several great guys from Jellico, Tenn and a nice couple from Asheville. God blessed us in many ways that day – He has so many ways of doing that, doesn’t He? Back to the Trip . . .
Well, after a brief hiatus from writing about our trip to the mountains – I now return. On Wednesday and Thursday of our week in the mountains, we climbed a couple of large mountains. On Wednesday, we hiked up Mt. Pisgah, which is located on the Blue Ridge Parkway. Named after the Biblical Mountain from which Moses viewed the Promised Land, Mt. Pisgah is quite an impressive ordeal to a flatlander. About 20 months ago, I tried to hike up Mt. Pisgah and found I was horribly out of shape. (I know, I should have already known that, but sometimes we just need a good slap in the face). At any rate, I began to work out and train and have now stood atop that grand work of God’s creation twice. This time I had the distinct pleasure of having my wife by my side – it was her first time and she was a champ at the climb. 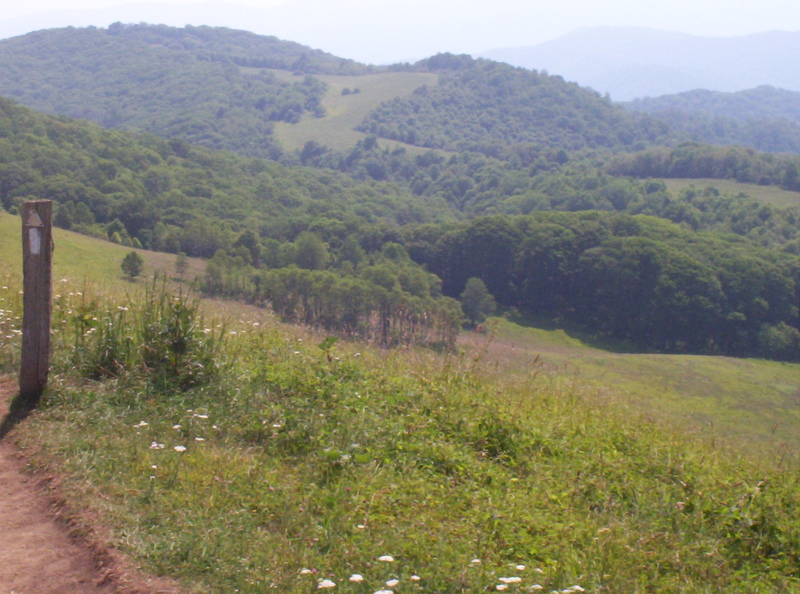 Next – our trip up Max Patch Mountain and a hike on the Appalachian Trail. The news is breaking even now that NC Senator Jesse Helms has died. The Fourth of July is a good time for us to think about the history of this statesman. Like him or not, you must admit you always knew where Jesse Helms stood. He did not wait for poll results to see what his opinion would be. With a large percentage of the population, he was unpopular – for that very reason. Today (and this is SO evident during the political season) we have a bumper crop of politicians. I don’t know how Webster defines the terms, but allow me to give you my definition. A politician is one who will cut a deal in a heartbeat in order to get (and stay) elected, driven by the desire to be popular – they give no evidence of personal convictions. Polls and popular opinion are their moral compass. A Statesman is motivated by a desire for national good, even at the expense of their own popularity. Their convictions are such that others are drawn to the truth that there are unwavering rights and wrongs. A statesman will sacrifice their own career (and even their life) before they will compromise their convictions. It was statesmen who gathered to prayerfully construct such documents as our Declaration of Independence and our Constitution. It was statesmen who then pursued at all cost the dream that all men are “endowed by our Creator with certain inalienable rights. . . “ they are a dying breed. We have lost one more even this day. May God grant peace to the Helms family during their time of loss and may God continue to bless America.